3) The person is a spouse of an Indian citizen. A person who holds a PIO card enables the person to travel without the need of a visa and other benefits. 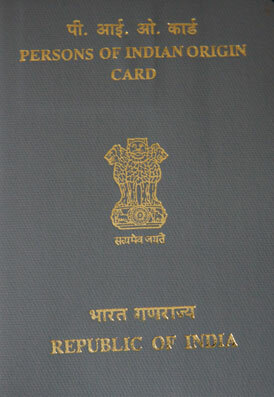 A scheme introduced by the Indian Government is the PIO card scheme under which those persons of Indian origin up to the fourth generation are eligible for this scheme. Those eligible for this scheme may be settled throughout the world except Afghanistan, Bangladesh, Bhutan, China, Nepal, Pakistan or Sri Lanka. PIO card should be accompanied with a passport. The validity of this card is for 15 years from the date of issue. The passport also has to be valid for the PIO card to be also valid. Visa is not required to visit India. PIO Card holders are exempted from the need for registration if they stay in India for less than 6 months. If they stay for more than six months then they have to register within 30 days of the expiry of six months. All facilities in case of acquisition, holding, transfer and disposal of properties in India other than agriculture or plantation properties. Admissions for various educational institutions are available for the children of Non Resident Indians under the general category. They do not require a separate Student Visa for admissions. Housing scheme facilities are also available. However PIO’s are not allowed to vote and is not eligible for an inner line permit. To apply for issuing or renewal of a PIO Card, the person has to fill the prescribed form along with proof for required documents to show that he is a person of Indian origin. The application form can be obtained from the various Indian Missions abroad, Foreign Regional Registration Office and also from the Ministry of Home Affairs. R.K. Puram Sector – I, New Delhi. Craw Ford Market, Mumbai – 400001. No. 26, Haddows Road, Chennai – 600006.